Prepare chickpeas as per instructions on pack. Once cooked, allow to cool. 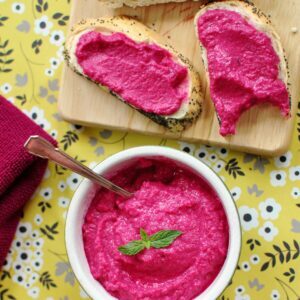 Process drained baby beets, chick peas, slivered almonds, Greek yoghurt, extra virgin olive oil, lemon juice and garlic in a food processor until smooth. Season with salt & pepper. Serve with crunchy pita chips: To make pita chips cut pita bread into triangles. Spray with cooking oil spray, season with sea salt and bake in a moderate oven for 15 minutes or until lightly browned and crunchy. Recipe and image kindly provided by McKenzie’s Foods, for more recipes visit their website.